This chapter aims to examine the use of social media in marketing library and information services in Nigeria libraries. The growing use of social media such as Facebook, Twitter, MySpace, YouTube by users in the 21st century is providing new challenges for libraries and librarians in Nigeria to keep up to with the growing needs of their users. The main purpose of this chapter is to examine the use of social media in the marketing of various library services and products. 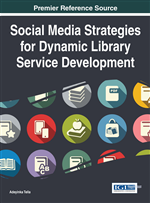 This chapter also attempts to describe the role of social media in library services and the various opportunities of using social media tools in marketing library products and services. In addition, the challenges faced by libraries in Nigeria in the use of social media are highlighted and possible recommendations are made. Social media has become a necessary and effective tool in today’s environment to market any product. Social media is a very important communication tools through which libraries can market new library and information services. Google fan (2011) reported that Facebook has about 750 million users, Twitter has 250 million users, LinkedIn has 115 million users, MySpace is used by 50 million people while 25 million people uses Google +. Social media is a strong form of communication and the number of users on popular social media site is increasing at a great speed (Burkhardt, 2010). Social Media usage by libraries is becoming important and a growing communication tool that is used by libraries to interact with library users. It also provides effective library services to potential library users. Attitudes of users towards library services are changing every day because today’s users want practical and quick information. With social media, providing a quick and easy information access and retrieval to users is no more a great challenge to the library. Hence, library should experiment and accept new technology (Mishra, 2008). Nigeria has one of the largest internet users in Africa and the 11th in the world. The number of internet users in Nigeria alone is greater than the entire population of some countries. In addition social media tools are majorly used for sharing news and information and followed by social networking. In Nigeria, there are over nine million Nigerians who are active on social media. Suffice to say, as the world continue to embrace and adopt social media, the various ways to use social media are becoming clearer. Social media (SM) has opened new platforms for libraries and information professionals to market library and information services (Jain, 2013). Use of social media would empower users to have more exposure of library services, increase traffic to the website, cultivate more responsive audience as well as increase the usage of library products and services. According to Jain, (2013) social media consist of various user-driven marketing channels such as Facebook, Twitter, Blogs, YouTube, Flickr and others. These tools have lot of benefits over traditional marketing. Traditional marketing is time consuming and expensive while social media marketing is time saving, cost effective and it is exciting and stimulating especially to users. Through social media information can get to the community instantly and in a creative manner; whereas; in the traditional marketing, there is limit to where it can reach in the community. There is a limited means for marketing in the Traditional marketing and there is little or no interaction with users while in social media marketing, there are a range of channels that could be use for marketing. Social media brings libraries closer to users and vice-versa. Traditional marketing is a one way marketing, passive and time bond while social media marketing is a collaborative marketing, it is interactive and no time limitation. From the above, it could be observed that social media has a lot of potentials if it is adopted in the provision of libraries services to users. It potential cannot be over emphasized because it has broken the barriers of the library walls and physical space. Libraries and librarians are responding to the popularity of social networking sites and their increasing role in the creation, use and sharing of information. The popularity of social media is achieved by engaging it as a central medium for communicating with library users and meeting their information needs as well as providing effective library services (Verzosa, 2010). Social media websites can be used for election campaign most especially by politicians to communicate with their constituents. It can also be used as an effective tool to aid law enforcement agents in investigating crimes.